Mr. Essa is the eldest of a clan of seven brothers, all with many children. Mr Essa and one of his brothers live in a village near a military target that was repeatedly bombed during the war. He has four children that were born blind from cataracts and eye deformations after the war. His brother who lives near by has two children, one of which was also born with the same problem. There is no history of blindness in the family and the other brothers who live in other villages have children with normal sight. The day I visited, several of the brothers and their children were at Mr. Essas house. There were more than twenty children, all cousins, running around in the yard. Five of them blind. After spending several hours with the family, I was preparing to leave. Mr. Essa invited me to stay for lunch. I politely declined saying truthfully that we had another family to try and find that afternoon in a distant village. The brothers gathered around and Mr. Essa spoke sternly to my guide. Translating, my guide said that they were from the desert Jubur tribe and that if I refused their lunch invitation they would have to kill me. "What do you say?" said my guide. I replied that I hadnt planned on dying that day. They all laughed and I was escorted into the house for a sumptuous meal set out on the floor surrounded by pillows to lay back on. 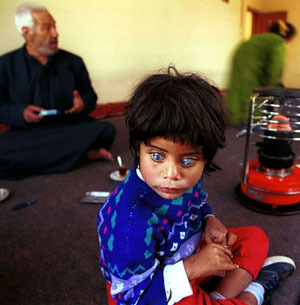 The effects of depleted uranium are not limited to the south of the country. After the war thousands of soldiers that had been exposed to DU contamination returned to their homes throughout the country. In the tiny village of al-Abbara, two hours north of Baghdad, there are three families that have children born blind from cataracts. 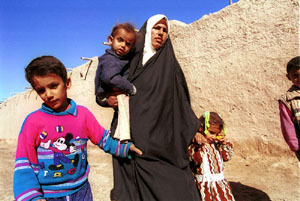 This village was not targeted during the war and the village has no other history of blindness. All three of the fathers though were soldiers who fought in the trenches of the Kuwait desert.